Taking care to practice what I preached in my last blog, I remain tasered into beans. Apricots and cherries are on their last legs in Michigan so I incorporated them into a farewell to summer salad–a nice side dish for a Labor Day barbecue. Any of these ingredients may be substituted with whatever needs using in your fridge or pantry. Please don’t bemoan the ingredient list. (Really? Grapefruit Vinegar?) These are simply items that were rolling around in my cupboard. Substitute what needs using up in your pantry. Goat Cheese for the feta, any nut for the pistachio, couscous for cracked wheat, any fruit-enhanced vinegar for the grapefruit, peanut or walnut oil for the hazelnut, garbanzos for the black beans…and so on and so forth. Soak beans in 3 cups of water at least 6-8 hours. Drain liquid, rinsed, sort and place in a pan filled with 3 cups salted water. Bring to a boil and then reduce to a simmer. Cook 1-2 hours or until beans are tender. 2. 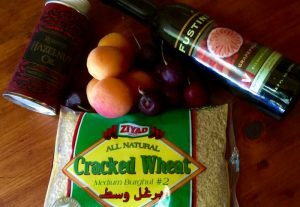 Cook cracked wheat (bulgur) according to package instructions. 3. Macerate shallot in vinegar 15 minutes. 4. 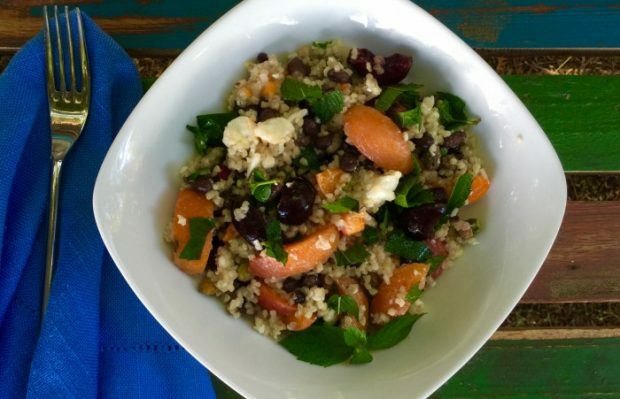 Combine cooked beans, cracked wheat, feta, apricots, cherries, pistachios and 1/2 cup of mint of parsley. 5. To make a vinaigrette, whist oil into shallot-vinegar mixture. Toss with salad and then season to taste with kosher salt, cayenne and additional mint or parsley, if desired. Yes it is, Tania! I was so glad to feed you before your great adventure!